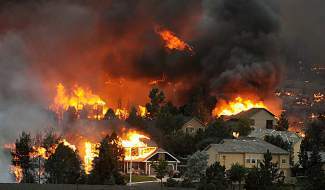 An entire neighborhood burns near the foothills of Colorado Springs from the the Waldo Canyon fire. The Rocky Mountain Area Coordination Center has predicted fire potential will be below average for June and July in the Rocky Mountains. Read the rest of this story at http://www.denverpost.com.